Besides the obvious, partying or sleeping, there are lots of interesting things to do in Bangkok at night. Bangkok is infamously wild at night (and downright depraved, some might say), but if you are not a party animal, don’t despair. 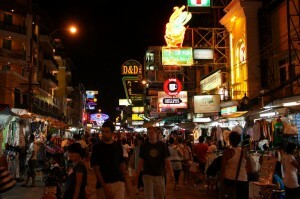 You won’t get bored at night in Bangkok, even if you are not fond of clubbing. Bangkok’s once sleazy image does not reflect reality anymore, and the city is surprisingly safe and full of fun and relaxing activities at night. Bangkok is a shopping paradise regardless of the time of the day, and it is also notorious for its night markets and bazaars. If you don’t feel like confronting the heat of the midday sun in a throng of sweaty people, just leave your shopping for later. Besides, the city is at its best after dusk. 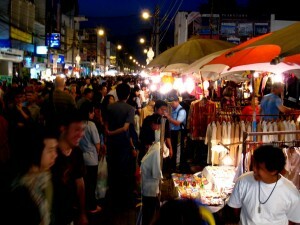 The largest night market is right in the middle of the red lights district, alongside the cheeky bars and clubs of Patpong. You won’t find any quality goods here, but what they lack in quality they compensate with quantity and diversity. Bootleg CDs, electronic devices, toys, trinkets, souvenirs and imitation Rolexes rule the market, so be careful what you spend your money on. Bangkok’s attitude towards transvestites and gay people is a lot more lax than that of the West, and many gay, transvestite and transgender men (referred to in Thailand as ladyboys) choose an artistic career as cabaret dancers and singers, and their shows are notoriously entertaining. Bangkok boasts some of the most famous and fabulous ladyboy shows in the world, mixing Hollywood glam, disco style and oriental legends. Ladyboys shows are art in Thailand, they are highly creative and extravagant. Bangkok is a jazz lover’s paradise, even if it is far removed from the cradle of jazz, the US. You can find anything from cramped, smoky little bars, to stylish jazz clubs and British style pubs, all playing only the best of jazz. The The Oriental Hotel’s Bamboo Bar has risen to international fame, and has been voted several times the best jazz venue by Metro Magazine. Jester’s, not far from Oriental Hotel, caters to the younger crowd, and Saxophone Pub is very popular with expats. Just pick up a free nightlife guide when you arrive in Bangkok and browse through the amazing selection o jazz clubs in the city. After a long day spent exploring the many attractions of Bangkok, you can treat yourself to an evening at a spa and getting a genuine Thai massage. A night at a luxurious spa is the perfect antidote for long sightseeing trip, and Thai ,assages are famous for their rejuvenating and regenerating effects. You can choose an aromatherapy and oil massage, a facial massage or foot massage. If you want to make sure that you get a traditional massage, go to Wat Po, the temple of the reclining Buddha, where the same techniques have been used for centuries. 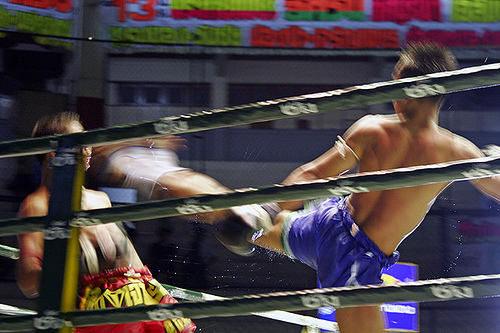 Thai boxing is the national sport of Thailand, and it is a type of fighting where the fighter can use their punch, knee, elbow, arms, and legs to defeat their opponents. The boxers are usually lite and very fast, and the fighter’s size doens’t give a hint about who the winner will be. The audience is just as interesting to watch as the match itself, as people are completely absorbed in the fight and cheer in the most creative ways imaginable.